Format: Television Show, Book, Audio. Time of Origin: Gallifrey (Distant past), spent millenia trapped in a world of anti-matter. Appearances: "The Three Doctors", "Arc of Infinity", "Omega" and "The Infinity Doctors". Doctors: Second Doctor, Third Doctor, Fifth Doctor, technically the First Doctor. Companions: The Brigadier, Sergeant Benton, Jo Grant, Nyssa and Tegan Jovanka . History: Originally, Omega was one of the three Founders of Time Lord society, along with Rassilon and the mysterious individual known only as 'the Other'. As revealed in "The Three Doctors" and expanded upon in flashbacks in the audio 'Omega', Omega was responsible for the Time Lords harnessing the colossal power needed to utilise the secret of time travel; namely, the creation of the stellar manipulator known as 'the Hand of Omega' (Named by Rassilon after the apparent death of Omega), which, when launched at a sun, would create a black hole that could be trapped and used as power for the TARDISes. Although he put this idea forward at school (When he was known as 'Peylix'), his teacher found it foolish and dangerous, and gave him the lowest grade possible, earning him the nickname 'Omega', leaving the former Peylix desperate to turn it into a positive. In the anti-matter universe he then found himself in, Omega swiftly learned how to harness the power of the singularity that existed there, creating an entire world based solely on his will. Although forced to wear a mask in order to protect himself from the corroding effects of the singularity, he knew that such a measure would only be a temporary means of protecting himself, and thus dedicated much of his time towards finding a means of escape. Although he could create a means of transport back to his own universe, he swiftly realised it was useless; as he was the 'Atlas' of his world, it kept him locked into it so long as he was in control, but the second he abandoned control, the whole place fell apart around his ears and he had to rebuild from scratch. Eventually, however, Omega was able to extend his control beyond the anti-matter universe, triggering a power drain on Gallifrey and sending a sentient 'time-bridge' to Earth to target the only Time Lord whose location was a given certainty; the Third Doctor, currently exiled to Earth and working for UNIT. However, due to the distance it travelled, the Time Bridge fails three times to get The Doctor, instead capturing a park ranger who discovers it, a visiting scientist in The Doctor's lab, and Bessie, The Doctor's yellow roadster. Forced to retreat into the TARDIS, The Doctor sends a distress call to Gallifrey, but the Time Lords, unable to get any more aid, dispatched the First and Second Doctors to aid their present self (Although the First Doctor was trapped in a time eddy and could only advise his future selves). Deducing the bridge's nature, the First Doctor encouraged the Third Doctor and Jo Grant to see where the bridge took them, and the two of them were transported to Omega's world, followed later on by the Second Doctor, The Brigadier and Sergeant Benton. In a desperate bid to stop Omega, the Third Doctor faced the dark side of Omega's mind in a fight, but was nearly killed, and was only saved by the Second pointing out that Omega needed the Third Doctor in order to escape. Omega explained his dilemma, and revealed that he wanted The Doctors to take his place so that he could escape his world. However, as they removed his mask, they realised that Omega actually couldn't leave the anti-matter world; the singularity had already corroded away his entire body. Omega existed only because his will insisted that he did, and his will was all that remained of him. Outraged, Omega triggered an earthquake, but The Doctors and their companions were able to flee to the TARDIS, where they, along with their first self, discovered the Second Doctor's recorder in the TARDIS force field generator... and realised the advantage that gave them. Since matter and anti-matter cannot co-exist without the mutual destruction of both, when The Doctors and their companions had entered Omega's world, they had been converted into anti-matter, but since the recorder had been in the generator, it had remained in its matter state, although shielded from the anti-matter by the force field. After sending their companions back to Earth, The Doctors tricked Omega into throwing the recorder out of the generator, destroying his universe... as well as himself. The First and Second Doctors returned to their places in time, and, as thanks for his role in saving them, the Time Lords lifted the Third Doctor's exile to Earth. However, as the Fifth Doctor was later to learn, in reality, Omega somehow managed to survive the destruction of his world, although he now lacked the power he had possessed before The Doctors defeated him. 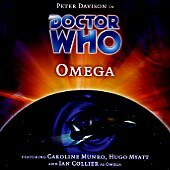 Somehow, Omega was able to contact Gallifrey, forming an alliance with a Time Lord known as Hedin, who believed that, since Time Lords the universe over owed their status to Omega, his return was all that mattered. With this in mind, Hedin stole a sample of The Doctor's biodata while Omega hid in a collapsed Q-star, which generated a radiation that would allow anti-matter to exist in our universe for a time, at the same time using a fusion booster element on Earth to provide the power for the transfer to succeed. However, since the element would only work with a certain amount of water pressure, Omega was forced to station himself in Amsterdam; since it was under sea level, it was the only place where Omega could work the generator properly. The Fifth Doctor, Nyssa and Tegan Jovanka, with the aid of a technician called Damon, managed to identify the traitor as Hedin and isolate Omega'slocation on Earth, but although they arrived in time to disrupt Omega's attempt to take control of the Matrix, they were unable to prevent him grafting The Doctor's biodata extract onto himself, turning Omega into The Doctor's physical double. Although Omega escaped to explore his new world, The Doctor quickly realised that the transference was unstable, forcing him to pursue Omega armed with a matter convertor gun that was the only means of stopping him. Eventually, they cornered Omega at the end of a pier as he began to decompose, but Omega, not wishing to return to the living death of the anti-matter universe, accelerated the decay of his shielding, determined to take the Earth with him, and The Doctor had no choice but to shoot Omega with the matter converter gun, destroying Omega before he fully reverted to anti-matter. After this encounter, Omega appeared to become an incorporeal spirit, drifting listlessly until he latched onto a woman called Senetia - a telepath whose mind acted as a focus - on a holiday tour where tourists witness Omega's final moments being acted out. The Doctor arrived and began to investigate murders that were apparently being committed to turn the trip into a re-enactment of Omega's final journey - including cutting off the hand of the actor portraying Vandekirian - the insane Omega now attempting to return to the safety of the anti-matter universe after all the perils that he had faced in this world, even telepathically communicating with The Doctor to ask him for help. However, since Omega was an incorporeal spirit, he couldn't have been the one committing the murders... until it was revealed that Omega and The Doctor were actually the same person; Omega survived the battle in Amsterdam at the cost of his sanity, for when he copied The Doctor’s bio-print, he acquired a copy of The Doctor’s mind as well, with the dimensional anomalies of the region increasing his madness as he telepathically influenced the actors portraying himself and Vandekirian to re-enact his voyage. Thanks to a telepathic message broadcast by The Doctor/Omega, The true Fifth Doctor was summoned for aid, fully up-to-date on the situation... but, as things began to collapse, he realised that Omega's distorted mind had linked itself to The Doctor's greatest shame. In his madness, Omega believed that the star he destroyed had been an inhabited one, and Vandekirian had tried to stop him, but this was simply linked to a terrible mistake The Doctor made once in his past. Long ago, The Doctor encountered a Lurman colony under attack by space pirates who used telepathically-controlled weapons and ships. The Doctor helped the colony to defend itself by creating a telepathic dampening field... but he didn’t realise until too late that the same asteroid belt was inhabited by the Scintillans, creatures of pure thought, and when The Doctor used the telepathic damper against the pirates, he inadvertently wiped out the entire species. In the final moments, Senetia, realising that Omega had gone over the brink of madness, sent the ship flying towards the black hole in the area - and the only other survivor, an actor called Daland who had portrayed Omega in the tour, set the TARDIS to dematerialise, realising that The Doctor was too weighed down with guilt from his past mistakes to make the decision himself; by leaving, he condemned Senetia to death, but he would have risked the lives of Daland and the tourists by staying. Visited by two Time Lords from the future as Omega fell into the black hole once again, Daland left to begin a new career portraying The Doctor on the future Gallifrey, The Doctor asking the historians of the future to remember him and Omega with their flaws as well as their good deeds, acknowledging Omega's role in creating Gallifreyian society and The Doctor's role in the death of the Scintillans, rather than focusing on Omega's madness and The Doctor's heroism. Although Omega's precise fate after this encounter is unclear, it would appear that he returned to the anti-matter universe and his original godhood (Senetia was torn apart by the singularity as she crossed the black hole). Based on available material ("The Infinity Doctors"), it would appear that Omega discovered that an earlier attempt to rescue him by another Time Lord, Savar, had created a breach in space-time that was capable of rewriting reality when his TARDIS had been unable to escape the black hole it had used to enter Omega's realm (Savar escaped by ejecting his console room), his TARDIS elongated to almost a light-year in length while allowing Omega to focus the power of the singularity into the real world, even if Omega was still trapped. Learning how to control the Effect, Omega subtly rewrote history in the outside universe to create a Doctor who had never left Gallifrey, having remained to become a member of the High Council after the death of his long-lost love, apparently hoping that the new Doctor would be fundamentally easier to manipulate ("The Infinity Doctors"). Having lured The Doctor into his realm and reunited him with his lost love, rescued from the moment of her own death but too injured to survive in reality, Omega returned to the matter universe in a duplicate body that The Doctor had created while bypassing the Needle's defences, intending to evaporate the event horizon around the Eye of Harmony and gain the power of the singularity in the real universe while The Doctor remained in his paradise world, forever content to be reunited with his lost love. However, his lover convinced The Doctor to return to the real universe by passing through the path between the two singularities, where The Doctor's efforts to use his own will against Omega's apparently undid Omega's alterations on history, the novel ending with The Doctor reflecting on where he would go next before reality returned to normal. 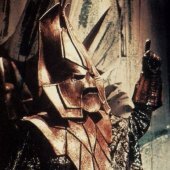 Although Omega has not been seen in the 'real' universe since, in "The Gallifrey Chronicles" it is implied that The Master, following his battle with the Eighth Doctor where he fell into the Eye of Harmony, had achieved a similar power to Omega, although he naturally resented his inability to use this power in reality, suggesting that Omega either lost control of the Effect or sought to conceal that power from the Master. While the Master was later resurrected by the Time Lords to serve as a warrior in the Time War after they were restored ("The Sound of Drums/Last of the Time Lords"), it is likely that Omega remains trapped in the realm of anti-matter, considering that Rassilon was also restored to serve as President ("The End of Time") and he remains a primary rival of Omega's.